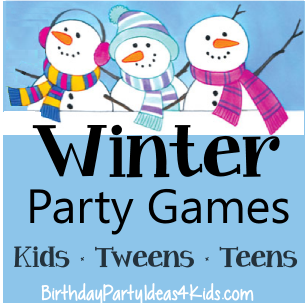 Fun Winter party games for kids, tweens and teen parties! Unique and cool games for the winter months - great for birthday parties, classroom parties, family gatherings and more! Gather together for a fun game of Charades with these Winter themed Charade clues! Free to print out and over 50 great clues. Pictionary is a fun game where you one player draws a clue they are given and the other players try to guess what is being drawn. We've included a free list of over 50 fun winter themed Pictionary clues! Ping pong balls - several for each player with a mark or color to distinguish from other players. Tape several plastic cups to the side of a table or kitchen island - so that the top of the cup is level with the top of the table. Players will stand on the opposite side of the table from the cups. Using a paper towel tube they will blow the ping pong balls from their side of the table to the other and try to make the ping pong ball land in one of the cups. The first one to get three ping pong balls in any cup wins! If the ping pong balls fall off the table the players can pick them up go back to their starting point and try again. The object of the game is for the players to try and unwrap the snowball enough to uncover a prize while it is their turn. The player next to them is rolling two dice over and over to try and get doubles. If they roll doubles then the snowball passes to them and they get to try. Before the party start to make a large round ball (snowball!) by wrapping the plastic wrap around and around itself. To make it a little harder to unwrap tape with packing tape every now and then so they can't unroll the whole ball at once. When you have a round base, about 2” diameter, start to add candy and prizes one at a time as you wrap around the ball. When you are done the ball should be large and have candy and prizes inside in layers. Players sit in a circle. The first player takes the ball and starts to unwrap as quickly as they can to get a prize. The player next to them has 2 dice. They roll the dice over and over trying to get doubles. If they roll doubles then ball gets passed to them and the dice get passed to the player next to them. Very fun and fast paced game! Players put their plastic cup on top of their head and has to balance it there for the whole game. Players use the spoon to pick up a cotton ball and try to place it in their cup on their head. Set a time limit and the player with the most cotton balls in their cup wins! If the players drop or spill their cotton balls they have to start over. Divide into groups of 2 or 3 players. Each group gets two rolls of toilet paper. The group decides who will be the snowman and who will do the rolling. On “go” groups take their toilet paper and begin to wrap their snowman around and around until their toilet paper roll is finished. When the rolls are finished they must put the hat and scarf on their snowman and yell “finished!”. The first group to wrap their snowman and decorate them wins. Have enough paper so multiple rounds can be played and each player has a chance to be the snowman. Relay style race where players sweep their "snow" around a turn around point and back and then hand off to the next player on their team. Mark the "snow" with different colors for each team. Each team gets the same number of foam peanuts (25 or more) or Ping Pong balls (5 - 7) and a broom. One at a time players sweep their peanuts around the playing area and back again. The game is even more challenging if played on a smooth floor and/or a stand up fan is place at the turn around point!